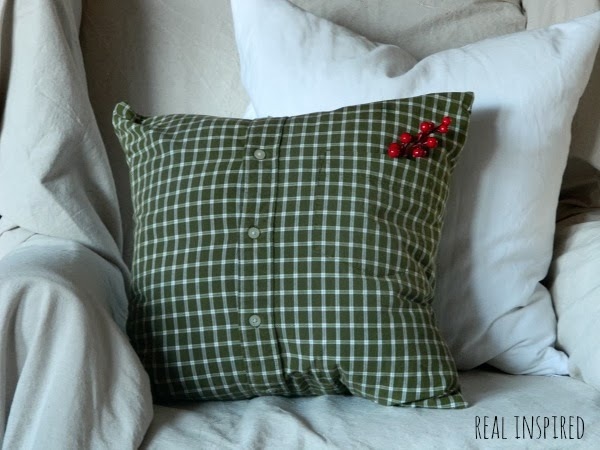 Real Inspired: All the Christmas Pillows! Last week I finally got my Christmas "Tour" up for everyone to see. There are several reasons that I finished that post after Christmas. One, I had an eliptical machine sitting in front of the fireplace. Two, I drenched my laptop with water. And three, I hadn't finished my mountain of pillows. Here is my couch with a few of the finished masses. The Christmas tree pillow in the center was my decor inspiration. I bought a couple of these a few years ago at JC Penny's. Every other pillow was made by me in a mad frenzy of Christmas spirit. Took me a few weeks to knock them all out, mostly working on them at night after Little Man went to bed. On the far left is the sweater pillow from my fall decor. You can read about that one here. 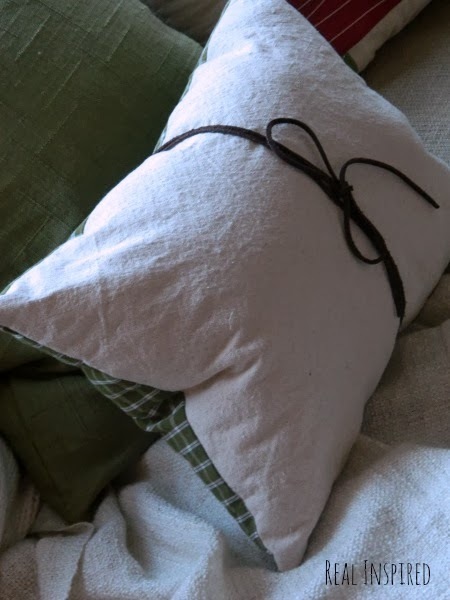 The solid green pillow used to be a tablecloth. Thrift store fabric for the win! On the far right is one of two white pillows that I made from a thrift store curtain. I used this tutorial I found at Vintage Revivals. I love her zipper trick! But, unlike the tutorial, I wanted my covers to fit the inserts trimly so I cut the material only an inch larger than my inserts. All the inserts are old feather pillows bought at the thrift store. 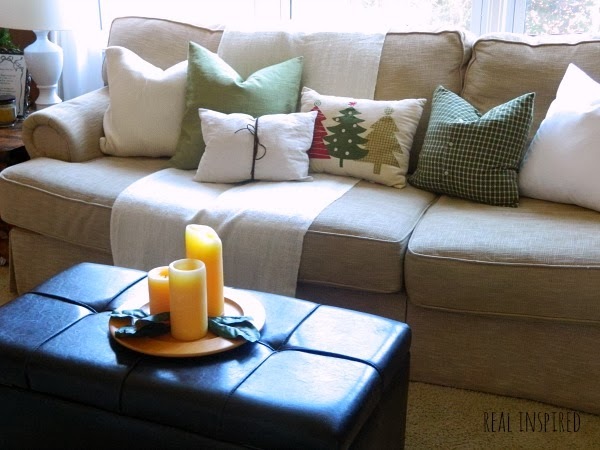 The cheap way to buy feather pillows! Best thing! This is definitely my favorite pillow of the bunch. My shirt pillow. Or, technically, Poor Hubby's Shirt Pillow. You can read more about it here. This is my second shirt pillow. I didn't have enough shirt material for one complete rectangle on the back so I cut out two squares, lined up the pattern and sewed them together to make a complete rectangle. For the front I used a leftover square of dropcloth from this project. The original plan included stenciling the front, but it was way too close to Christmas and, really, who needs that extra stress? Wrapping leather cording around it was way easier, still fit with my decor, and it was free. After making the Christmas tree skirt, I had 1/2 yard of faux fur left over. Soooo...another pillow. That I stuffed with leftover stuffing from when I shortened my King-size pillows. Good thing I hung on to that! 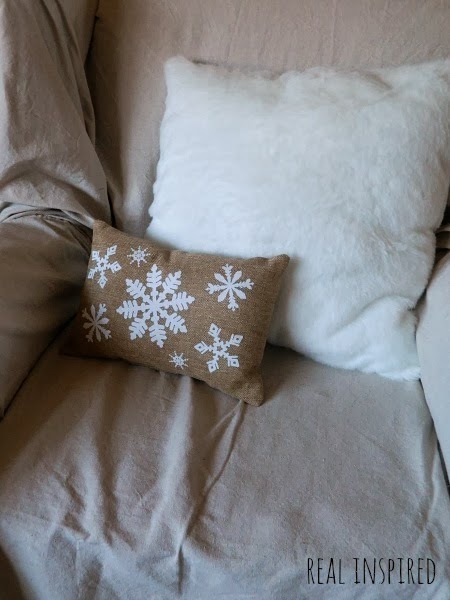 The snowflake pillow was in the dollar section at Target for $3. We really had a pillow-palooza at our house! You can never have enough pillows in my opinion. An opinion that, unfortunately, Hubby does not share. I should have remembered that before I cut up his shirt. Your pillows are so cute! I LOVE fun throw pillows, they are definitely one of my home decor weaknesses and I always feel like I need more of them!!!! (Which I don't lol!) These are cute! Thanks so much for your words! Yes, I would have pillows EVERYWHERE if money was limitless. I could have a bouncy house full of them! Congratulations! You've been featured on Wicked Awesome Wednesday! The Christmas pillow project came out great!! Please feel free to stop by the website and pick up your "I've Been Featured!" button! Your pillows are adorable. Thanks for sharing with us on Twirl and Take a Bow. Please come back any time! Very cute pillows indeed!! I really like each one but that Christmas tree pillow is my favorite among all. Nicely finished and I enjoyed the description in the meantime pretty much. Thanks.